As smartphones is becoming more and more important in our daily life, more and more functions have been added to smartphones. In smartphones, many functions have becoming new trend. For example, fingerprint sensor has been added to many smartphones. Recently face ID is showing on many new popular models. There is also another function that appears earlier than fingerprint, that is NFC. OUKITEL K10 is such a smartphone that adds not only fingerprint, but also face ID and NFC. First, Check remaining balance or recharge bus/metro card. 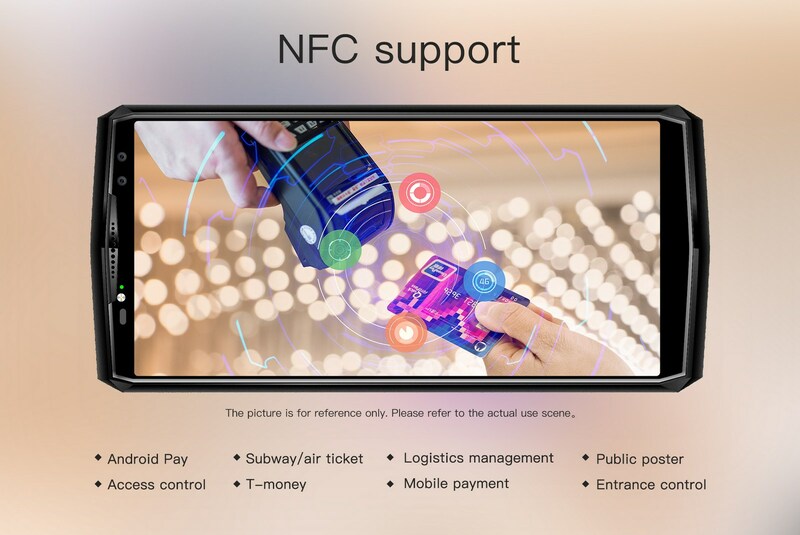 Like what is showing in the video, make sure you turn on all NFC choices, just put your buss/metro card behind your smartphone, K10 will read your card and allow you to check balance or recharge. Tips: after recharge, please put your bus card behind K10 until it shows recharge success. It saves lot of time, no need wait in line. Second, fast payment. This function is quite easy, set NFC function well, add your default bank card, you can pay with your K10. But the POS machine has to support NFC function. Third, entrance guard. Store the ticket or password in your K10 and put your mobile close to the reader, you will open the door. Forth, data transfer. Put two smartphone that both have NFC back to back, then transfer data like music, photos or contacts. This is faster than bluetooth since you have to pair bluetooth first before transfer data. Fifth, smart tag. Put a reader behind a tag and set the function, scan the tag through NFC of your smartphone, it can read this function and finish specified handling. For example, put a NFC tag on the door of a meeting room, everyone put mobile phone on it before start the meeting, then smartphone will enter mute mode during meeting. Sixth, access control. You can receive or download information through GPRS internet, then use it for payment or entrance guard control. For example, you can set specific SMS to the mobile phone of a housekeeping personnel to control the entrance authorization of your home. NFC function is becoming a standard configuration of smartphones to offer more convenience to mobile users. Besides NFC function, OUKITEL K10 also stands out due to the Helio P23 Soc, 6GB RAM and 64GB ROM, 11,000mAh battery, 21MP and 13MP with secondary cameras, 6.0 inch FHD 18:9 full screen. OUKITEL K10 will run Android 7.1.1 out of box and also supports fingerprint and face ID recognition! According to OUKITEL, K10 will go to market in January, more information will be displayed on OUKITEL official website.